1 1/2 kgs onions (yea, u need it baby) (5 onions cut, deep fired to brown, and ground to a paste). The rest of the onions, deep fried and keep aside. few whole garam masala kept aside too. The preparation starts a day early. The more u marinate, the better the result. No short cuts to this. Take the chicken , clean and cut to the size u want. A few chunky pieces are good. To that, add the dahi, ground deep friend onion paste, ginger garlic paste, lemon juice, garam masala powder, 3 table spoons of ghee. Mix well and refrigerate it. This needs to be marinated for at least 24 hours. Take the marinate off the fridge an hour before u being the cooking. Place the tawa on the slow burner at minimum flame. Above that the degchi, add two tablespoons of ghee, to that add the whole garam masala, let it crackle. Place the marinated chicken. Cover the degchi. forget about it for 2.5 hours :). Actually in between, u could open the lid and stir it a wee bit. Note: no salt to be added now. This is the secret to succulent chicken. Half an hour before the 2.5 hours, soak the basmati rice. The cooking has to be done on extremely show flame. after about 2.5 hours you will see the oil separated from the chicken and even the gravy reduced to half. In a vessel take 8 cups of water and add a teaspoon of shahjeera to it. 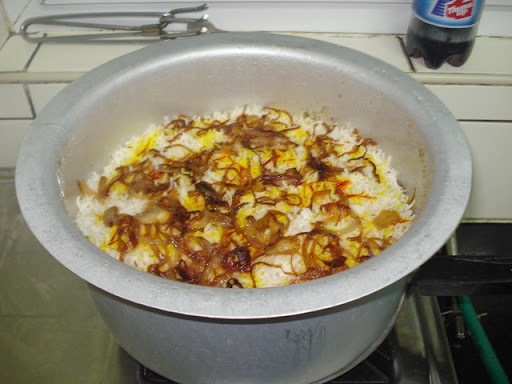 Once it starts boiling add the soaked basmati rice to it and cook it for about 5-6 minutes/parboil it. Please note that the rice must be only cooked 3/4th its normal softness. The rest will be cooked on DUM. The saffron must be soaked in hot milk for about 5-6 minutes. Now start the layering. 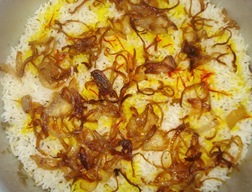 For each layer- first add the chicken gravy, then a bed of rice, a teaspoon of ghee , saffron with milk, and deep fried onion. 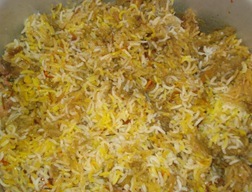 The last layer should be of rice, topped with the saffron, onions and ghee. Now, take a damp cloth and tie cover it round the degchi. Add some kneaded ata to seal the lid. Cook on dum for about one hour. Mix before serving, with raita of your choice. Lengthy but, very very satisfying. The pics u see are of the biryani i made last evening .